In addition to demonstrators/Ink-Vue fountain pens for showing customers how the inside of a fountain pen worked, Waterman also made Dummy Pens. They look like a regular Waterman at first glance, but they were not functional pens – they were just “dummies” for display. Since the pens often sat in display cases in shop windows, they were painted black to minimize fading from sunlight exposure. A hard rubber pen sitting in sunlight and heat for hours and hours, days on end, would fade and could be warped, and the pen would no longer be merchandise that could be sold. They also minimized the risk of theft. A gorgeous, working Waterman sitting in a window display would be tempting and a greater loss if it was stolen. Dummy pens were something that could be sacrificed. Those that were capped didn’t even need a nib and feed! Furthermore, when a customer returned their Waterman to the store because of faults or damage to the pen, those broken parts would be swapped with the equivalent part in the dummy pen (assuming it was part of the dummy pen). In the end, the dummy pen could be an assembly of parts from returns. These dummy pens are desirable to collectors since there are fewer than their actual counter parts. Other companies also made dummy pens, such as Conklin. 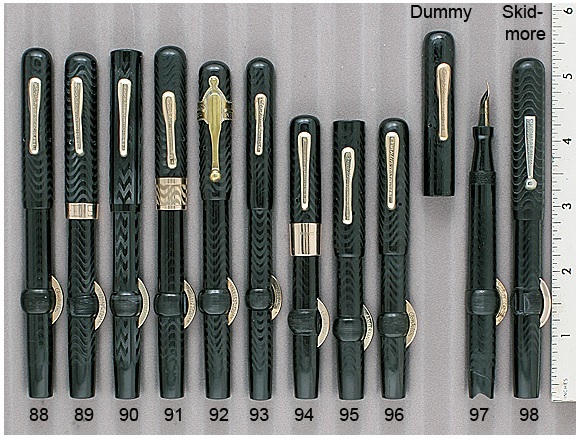 Below (#97) is a crescent-filler Dummy pen in black chased hard rubber. This pen is painted black or coated in sealant. In this case, the cap is removable, so this pen does have a nib (although it is labelled 14K Gold Plate). Note the V-shaped back end, likely to lock the pen in place so it couldn’t turn and ruin the display! This dummy pen is still available, if you are looking to add one of these to your collection! Beautiful line up, isn’t it?